We received a new shipment from Iga, Japan, just recently. So, all the donabe products are now back in stock! Also, included in the shipment is a new classic Kyoto-style donabe, "Ame-yu". 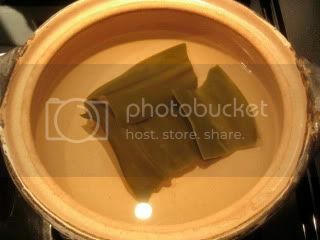 It's a wide-shallow all purpose donabe, which is typically used in Kyoto-style cooking. 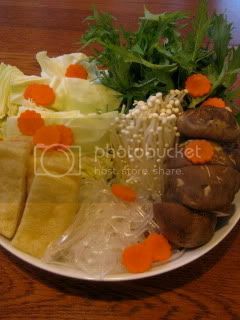 You can make different kinds of dishes including hot pot dishes such as sukiyaki, shabu shabu, etc. 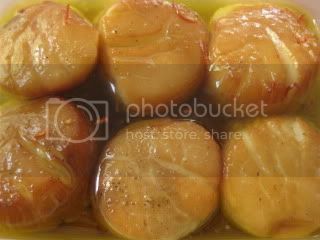 Because it's shallow, the body builds and distribute the heat quickly to the ingredients and also retains the heat very nicely. 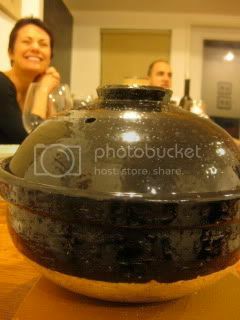 It's also a great donabe for making the quick stew/ braising dishes. You can find more detains/ order from our website. 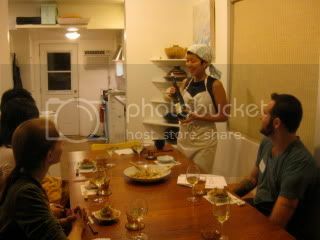 Last Thursday and Saturday, I hosted "Chanko" dinners in my Donabe & Japanese cooking class. 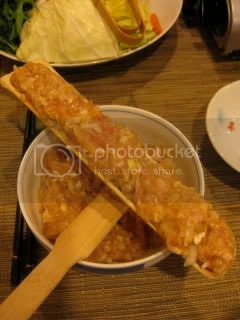 "Chanko" refers to any meals which Japanese sumo wrestlers eat. You might think they are heavy dishes, but the sumo wrestlers actually eat very balanced healthy meals. 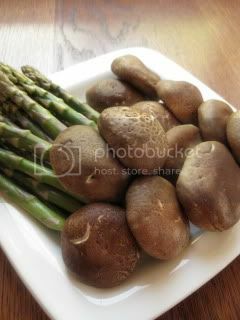 Their regular diet consists of a lot of protein and vegetables. They are so big because they intentionally put on weight by eating enormous amount of food. They also eat only 2 meals a day (right after a long hard training each time) and sleep right after each meal. 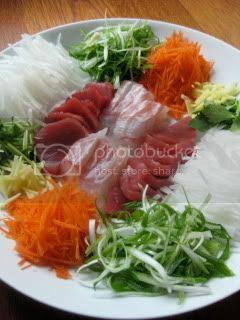 Sashimi salad...Wild-caught tuna and madai snapper, with a variety of vegetables. 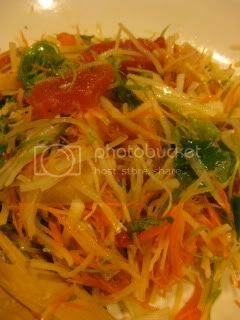 The dressing is a very healthy blend of kurozu (Japanese black vinegar), goji berries, etc. 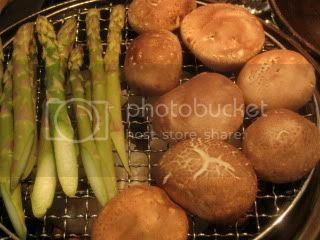 Tofu and shimeji mushrooms "Okonomi-yaki" is a healthy version of popular Japanese (savory) pancakes. 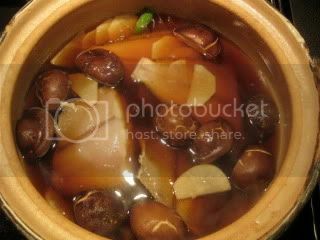 We made it with our tagine-style donabe, "Fukkura-san". 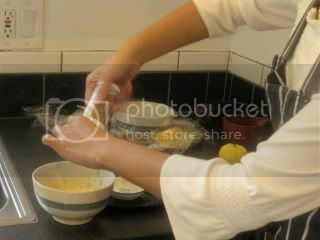 Once the pancakes are done, I brushed the surface with the special oyster sauce (made from Hiroshima Oysters!) and topped with the shaved bonito/ kombu flakes and scallions. The pancakes were nicely crispy outside and so fluffy inside. 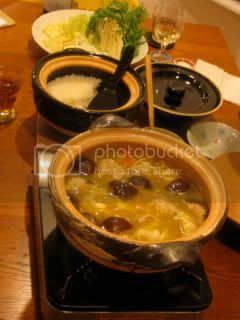 Time for the main course, which was salt butter chanko nabe (hot pot). 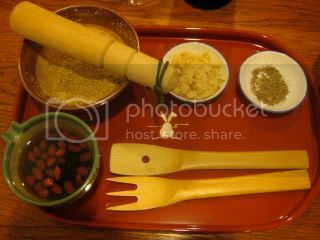 The ingredients including the condiments were first brought to the table. 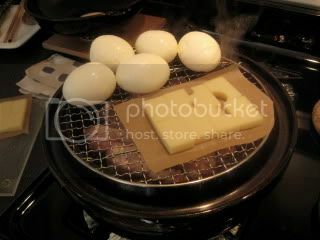 The classic-style donabe, "Hakeme", with the broth was set over the burner at the table. 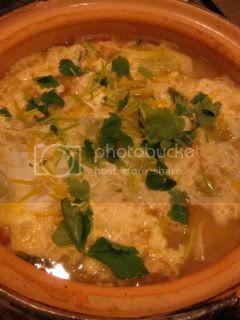 With the negi (Japanese green onion) and onions, only the chicken meatballs were cooked in the broth and served on the grated daikon for the first taste. 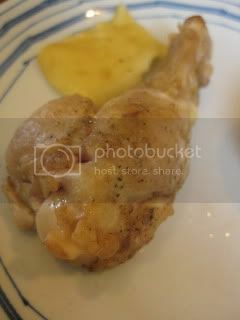 The chicken was so fluffy and flavorful. 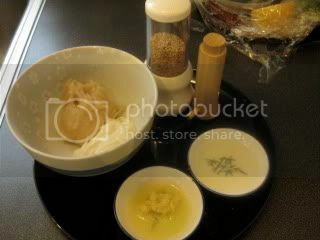 The broth (my collagen-rich chicken stock base) was seasoned with sake, salt, light soy sauce, sesame oil, la-yu, and butter. 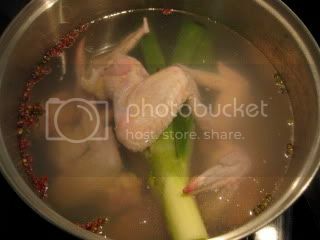 Then, we put more chicken with other ingredients to the broth. 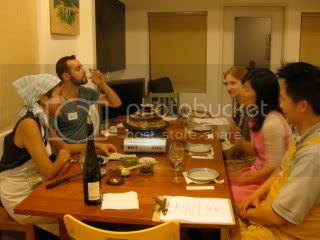 Everyone enjoyed it with different kinds of condiments ("yakumi"). 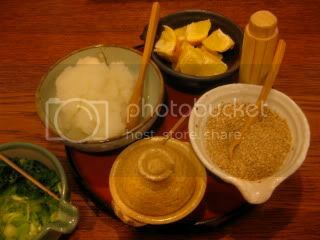 The "shime" (end of the meal) course was "ojiya" (traditional soupy porridge). 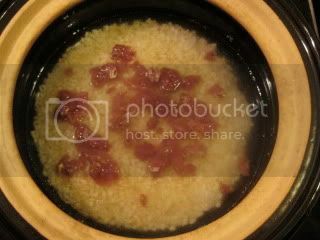 Once the rice was in the broth, the whisked eggs were drizzled over the mixture. 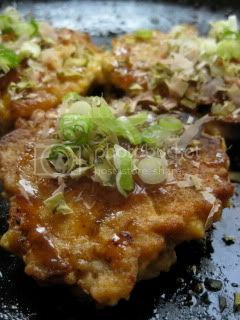 As a finishing touch, sliced yuzu rind and chopped mitsuba were scattered over the ojiya. 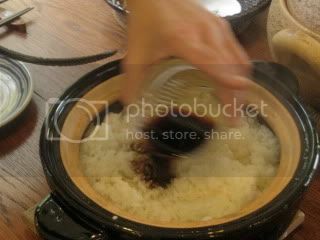 Using the rice cooked with our donabe rice cooker, "Kamado-san", certainly upgraded the simple porridge experience. 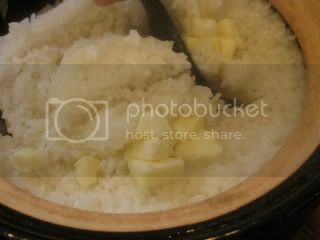 The texture of the rice was so nice, and the yuzu gave such a wonderful aroma. 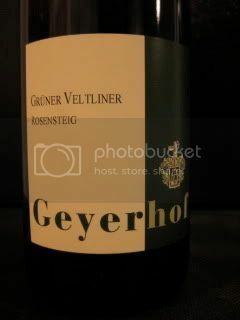 Classic Gruner-Veltliner was paired with the dinner. The new class schedule for March will be announced very soon...so, please stay tuned! 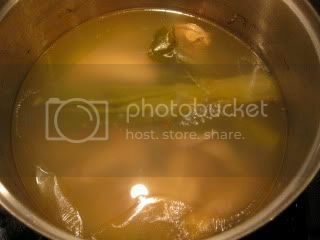 I used to make chicken stock from the whole chicken and it always tasted so rich and delicious. 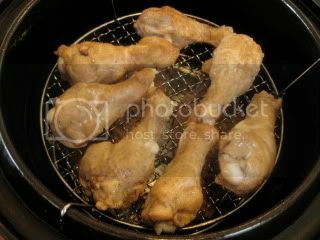 But lately, I love making the chicken stock with the chicken wings, and the result is super-rich and simply the best. Chicken wings are so rich in flavors and collagen. I get 2 pounds of organic chicken wings (Mary's) from Wholefoods. After rinsing them, I combine them with about 3L of water and 2 cups of sake. 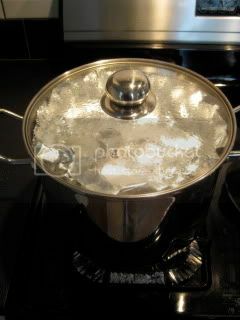 Once the water starts boiling, reduce to simmer, and skim any foam/ scum. 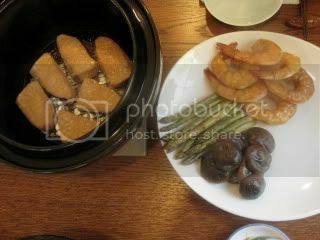 Then, just add the green part of negi (Japanese green onion), some ginger slices, and black and Szechuan peppers. 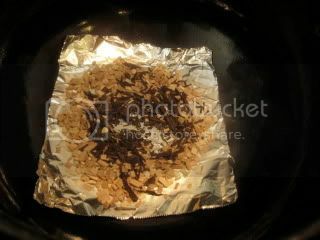 Covering the surface with the foil before closing with the lid helps the even distribution of the heat. 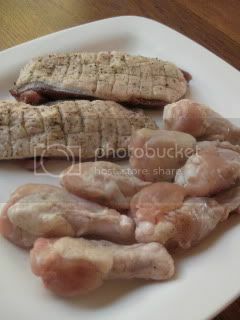 After 4-5 hours, you can visually see the gelatinous collagen starting to be exposed from every joint of the chicken wings. The stock is already very rich in flavor, so you can turn off the heat at this point and just make sure to hand-pick any gelatinous parts left on joints. 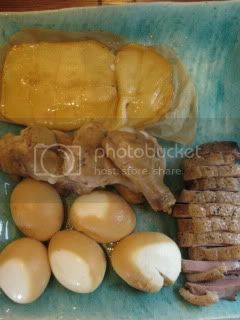 Or, you can continue to cook for up to 12 hours (which I did last Saturday), then all the collagen will be dissolved into the stock naturally. 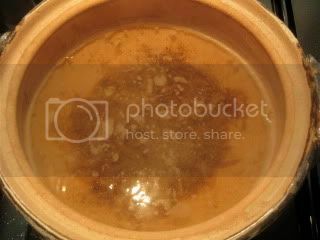 After straining the stock, it's good to chill it in the fridge overnight, then you can remove the grease which makes a solid layer on the top of the stock. 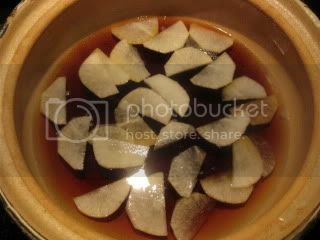 The cold stock is so gelatinous and looks so rich. 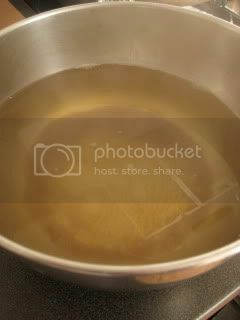 I've been making the same rich chicken stock past few days. 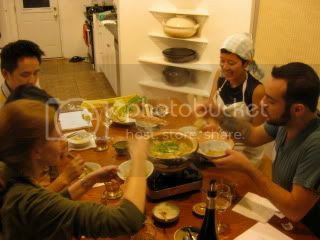 We used the stock to make the Chanko Nabe (sumo-style chicken hot pot) in my donabe/ Japanese cooking classes. 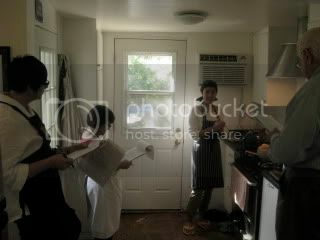 I will post the pictures from my Chanko class soon. 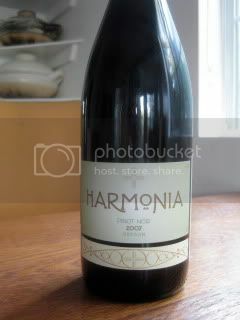 It was so much fun, and my skin is so smooth from all the collagen-rich broth I drank! 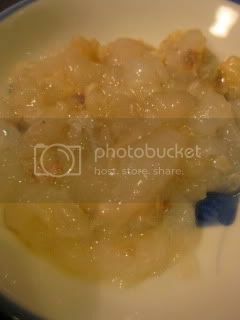 I made Karei no Nitsuke (braised flounder) again. 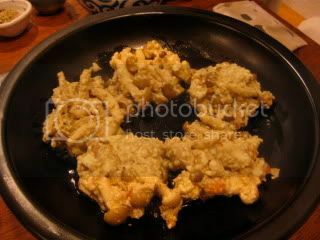 It's a popular rustic home dish in Japan. 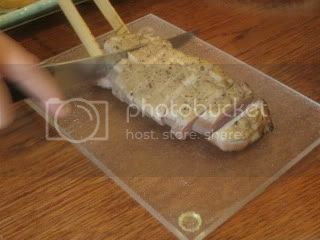 This time, instead of the whole fish, I go the fish cuts with the heads off. 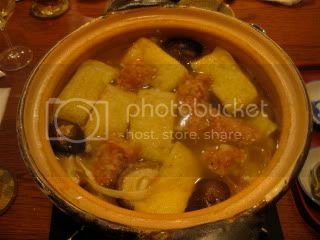 The classic-style donabe, "Hakeme", was used for this dish. 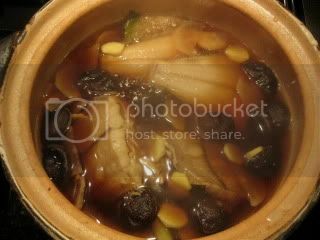 You don't need the dashi stock to start the broth for this dish. 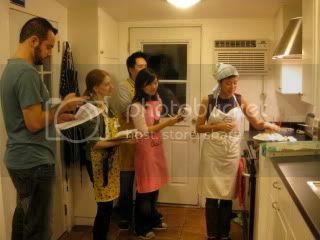 First, combine 400 ml water with 5 tablespoons of each sake, mirin, and soy sauce. 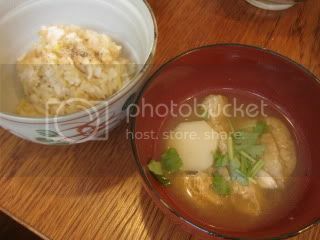 Since I had some daikon, I added the sliced daikon and green parts of some scallions to the broth and simmered for about 5 minutes. 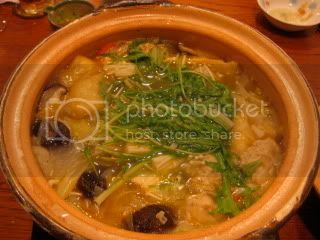 The broth will eventually become rich flavor after the fish and vegetables are cooked. 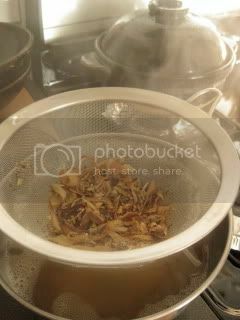 Shiitake, flounder, and ginger slices were added and continued to simmer with the otoshi-buta (drop-lid) on the surface before closing with the donabe lid for another 10 minutes. The aroma was really wonderful after 10 minutes. 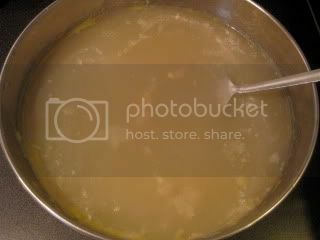 The broth was reduced and it turned rich. 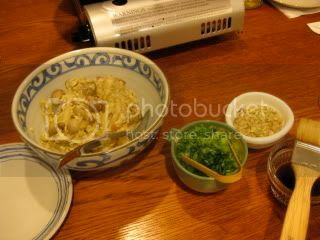 My simple Karei no Nitsuke was served with a garnish of sliced scallion ("Shiraga negi"). 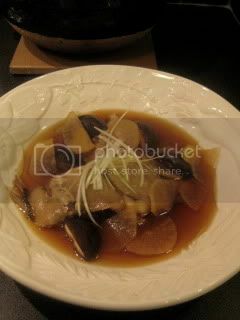 Because the fish was braised in the donabe, the texture was so rich and the flavor was deep and complex. For the duck breast I smoked the other day, I had the leftover carcasses of the duck with still some meat attached. So, I scraped off the meat and saved it to cook with the rice. 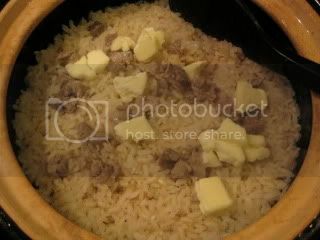 Even for such a little amount of leftover duck meat like this, it would give a lot of flavor to the rice. 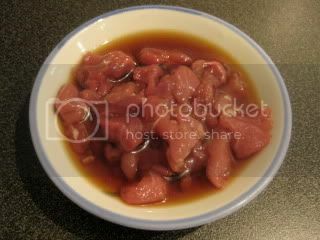 I quickly marinated the meat with about 1 tablespoon of soy sauce before it was added to the rice. 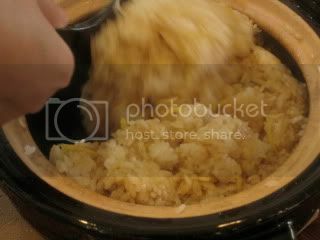 To the 2 rice-cups (360 ml) of white rice, I added 350 ml of water, 2 tablespoons of sake, 1/4 teaspoon of sea salt, and the duck in the donabe rice cooker, "Kamado-san". 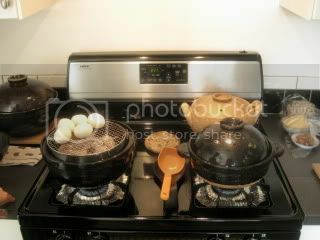 Then, the rice was cooked in the regular manner over the stove top. Rice was so aromatic when it was just cooked. 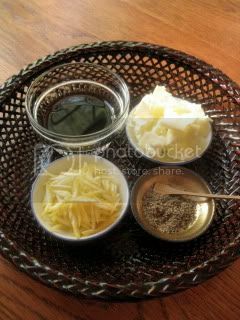 I added a couple of tablespoons of the butter to the rice and quickly tossed it. 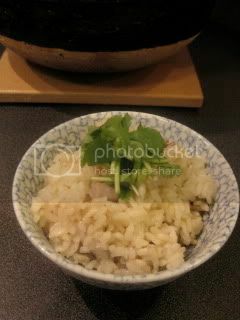 With the mitsuba (Japanese parsley) as a garnish, my quick rice with the leftover duck meat was ready. 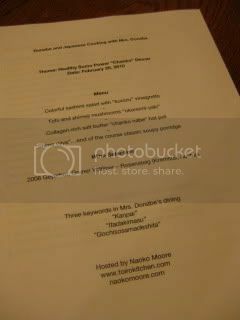 It was so savory and really delicious. 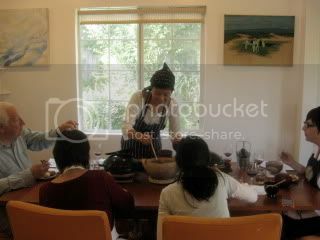 This past Saturday, we had another "Donabe and Japanese cooking class". The theme was donabe smoking. 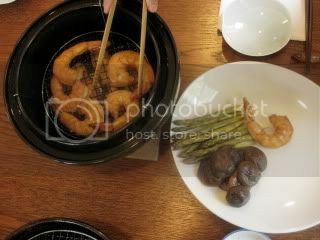 We used our donabe smoker, "Ibushi Gin", and made a variety of smoked dishes. Fresh dashi stock for the miso soup. We made the satoimo (Japanese taro) and shimeji mushroom miso soup. 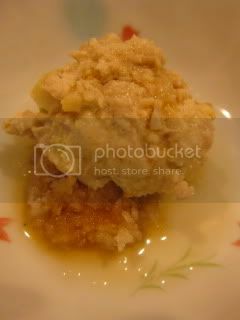 Miso was the premium "coarse" red kind from Fukui, which I brought back from Japan. Here are some of the ingredients we smoked. I went to different vendors for the best quality ingredients. 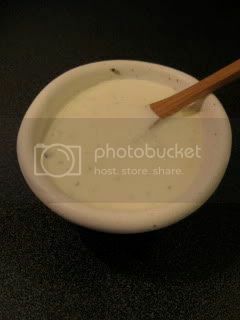 Preparing the dipping sauces. 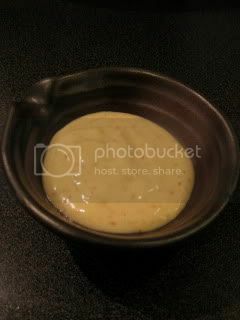 We made two kinds of sauces...Saikyo Miso Dipping Sauce, and Creamy Wasabi Dipping Sauce. 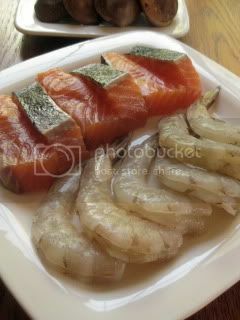 For the first batch, we smoked seafood and vegetables with the sakura (Japanese cherry blossom tree) smoke chips. 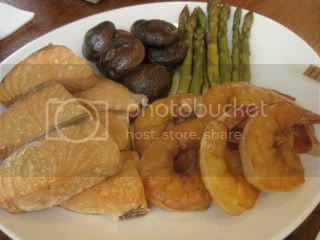 Wild-caught salmon, jumbo shrimp, asparagus and shiitake mushrooms. 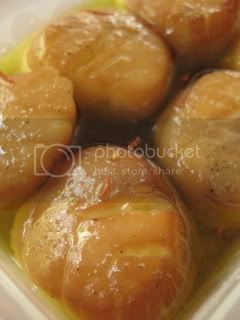 We also tasted Oil Marinated Jumbo Scallops. They were all fantastic. Everybody was so impressed by how smokey and fresh tasting/ texture at the same time the scallops were. 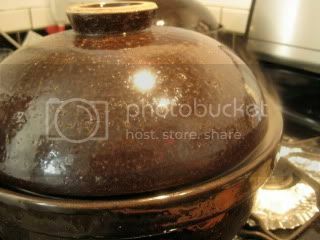 That's the magic of donabe smoking! The meat course was duck breast and chicken drummettes. They were smoked with the combination of sakura smoke chips and Japanese houji-cha (roasted green tea). 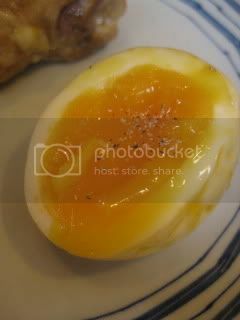 We also smoked soft-boiled eggs and Swiss cheese. 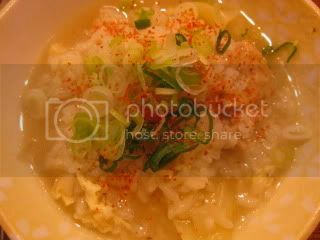 Miso soup was served with Yuzu Butter Rice. What a fun and delicious way to spend the sunny Saturday it was. We had a wonderful time with the wonderful guests! 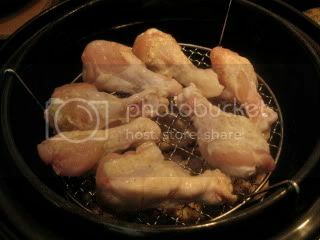 Super Bowl with Donabe Smoker, "Ibushi Gin"